It is common sense to plan before traveling, better planning means better things you could go at a better pace. It’s a common sense, especially planning for traveling to Russia. Although there are many guides and trip advisor to provide you with a suggestion about what to do. But once you go there without a plan, everything becomes messed up. So to make sure you could have a smooth sailing in your vacation, it’s better to prepare, steps to planning include what things you need to fit into your baggage, how much budget you like to spend, also which places you want to go, and how much time for your vacation, lastly, about what do you want to do. All of that is important to prepare, for traveling to Russia. Trust me, you will not regret this, also it wouldn’t hurt to read this guide, and when you feel helped by this guide. Feel free to come back and read another guide in this sites, which also taught you Russian culture and many others thing. Well, if you are planning to go to Russia a week from now, then at least you also could check this guide about 10 best places to spend fall vacation in Russia. And if you want to buy some souvenirs to take home or giving it to your relatives, then there is also a guide for that here. See? by using the compilation of the guide here, you could also start to plan by yourself steps by steps. Make an effective vacation plan to Russia by yourself. But, if you are anxious as this is your first time traveling, or feel better to listen to guide, you are coming to the right places in the sites. So here are the 7 steps to make an effective vacation plan to Russia. Which will make you feel the most exhilarating experiences. Well, this is the most obvious things to do, and it is really important you completed every paperwork needed. The government in Russia are strict with paperwork. Make sure your passports and visa are not expiring, you wouldn’t want to go to Russia just to get fined, also there are some places in Russia which need some document before you can enter. You should choose, when will you go to Russia, learn what time best suit you. I cannot say it’s autumn season if you like winter more and cold climate better. This is all about your preferences and what you want to see. Well, if you want to know what is the attraction for each of season, you could also find it in the sites. Although all is said and done, if you ask me. I will suggest you go in spring or better yet, Autumn season. Remember, Russia is big places, if you have one or two months to stay there, you might not have to choose. Just go to every place that is not prohibited. But sadly most of us obviously don’t have all the time. So choose based on what things you want to see in Russia, mix it. Whether you want to go find some quiet small town, or maybe big metropolitan cities. Traveling to each city nearby could effectively increase the places you can go. And this obviously increasing your time to enjoy your vacation effectively. There is a small town to see, which you can enjoy it quiet and historical sites. But if you want to enjoy green scenery or wild scenic places. There is no better places than go to Lake Baikal and its surrounding. Remember, when you choose your destination wisely. Don’t go from Sochi to Siberian, but from Moscow to Golden ring. Long Distance travel in Russia is just wasting your time which is already limited. Going to foreign places, there is a need to prepare your things to take it. Nowadays smartphone becomes a necessity, so don’t forget to prepare things like that, also you may want to take a bit of medicine. If you have any allergies, please don’t forget to take it. For taking beautiful memory into the picture, although there is a smartphone. To capture the best picture, there are no better things than a real Camera. Choose what you need to consume or use in Russia, also it’s better to check the detail in guide how to do backpack traveling. Anywhere, anyplace, the need for money is necessary everywhere. In Russia, they use Russian ruble, but there is some places in big cities, where you could use dollar currency which is rare, though. 1$ is the same as 67 rubles and it means it’s not as expensive for Indonesian people going vacation there. How much money you want to take, depending on what things you want to buy in there, also how long would you be staying there. Yeah, you didn’t read wrong, this is also one of the fundamental things to prepare. Obviously, if you were not healthy when the time for vacation arriving, then, you wouldn’t enjoy your vacation as much as you should. Clearly being healthy all years around is what we hope for, but sometimes because somethings or another it’s hard to stay healthy. So, if you want to prepare for your vacation, don’t forget to stay healthy. Although it’s complimentary and not a must do, but being able to speak some of their language could prove useful. Like for example, you are in foreign places, then you want to go to the toilet but don’t know where it is. Well, you could ask someone there. Russian people although know English, not everyone is, same in many country, so learning the basic vocabulary for daily use is useful for the trips. Alright, now that is all of the 7 steps to make an effective vacation plan to Russia. 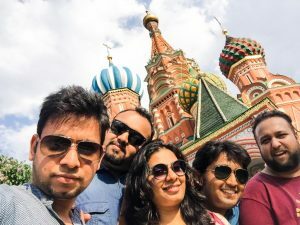 even though you might have other things you want to prepare, it is an addition to these 7 steps to make an effective vacation plan to Russia. because what is fundamental for effective traveling, not only Russia, but everywhere is the same. Should you use this guide as you were planning to go on trips, i would say, its the right choice. And see for your vacation will be more enjoyable. Also, don’t forget. Whatever times you want to go there, prepare carefully. You don’t want some surprise variable to come and ruin your enjoyable time. I wish you safe travel and enjoyable trips, good luck!